Dolly is known for several things - cleanest office, snazziest clothes, and fabbest hair. Everything about her seems perfectly normal and quite sane. Until you meet her children. Dolly adores Daisy and Violet. Probably more than any mother could adore her beloved daughters. The only snag is they're not human - they're dogs. But you wouldn't guess as much if you spent any time peering through the window of Dolly's life with her precious pups. 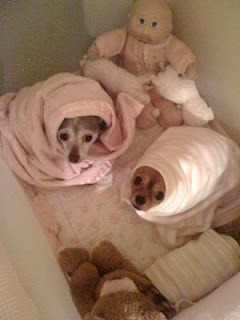 Yes - they are swaddled. Yes - they are in their full-size baby crib fitted with Winnie the Pooh bedding. And yes - they are looked over by their Cabbage Patch Doll, Zack Stewart (that's a peach onesie, not pink.) This exact scene goes down nightly after dinner and playtime and a final potty break. Daisy and Violet even have a stroller. How much less do you love your pets? She should set up a web cam so you guys can watch them from work. Also, you may want to check her filing cabintes to make sure they are not sleeping in there. As long as she's not licking them clean I'm not that weirded out. I love my dog - especially since he's kind of like me in the way that he doesn't liked to be touched. I love my cat. Though she has had a checkered past I love her. Though she urinates on the bath rug if left down I love her. Though she plays a mean game of "Guess Where I Threw Up!" I love her. Though she will climb up on my chest and lick the inside of my nose I love her. She's like the best cat ever. Nah, the cat I had growing up, Ellsie, SHE was the best cat ever. She was loyal and was more like a dog than a cat. Nope. My cat is definitely the best. He terrorized Jamie for a full year at college. He has extra toes. He sleeps on my feet every night. He is consistently my only pet that I don't have thoughts about killing on a daily basis (so sad for my dog and other cat). And now, as a bonus, I can say that he does not lick the inside of my nose - so he's even better than I thought! I think the swaddling helps protect against SIDS. Just so you know - Dolly read this blog and said the comments were her favorites. She was so excited to have the pooches' blog debut - she informed her mom!